We know that having a missing tooth is a big deal. A gap in your smile isn’t just an inconvenience, but can have a major impact on your confidence. Thankfully, advanced dental technology and science has created a remedy. When you visit your cosmetic dentist at Palola Dental in Mililani and Waipahu, we can provide a dental implant procedure to permanently replace the a missing tooth. Losing a tooth can cause social anxiety, embarrassment, and physical pain or discomfort. Years ago a lost tooth meant a permanent, unattractive gap in a person’s smile, as well as lower functionality of the teeth. Dental science has advanced continuously, and modern techniques now include permanent replacement options for people missing a tooth. 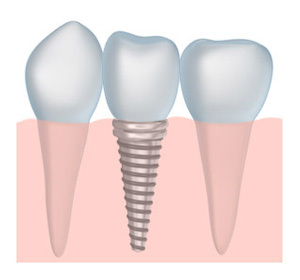 Dental implants are an amazing technology consisting of a titanium rod placed in the jawbone. The rod provides a point to anchor the porcelain crown or denture, creating a new tooth that won’t shift or move out of place. Dental crowns: If you are missing just one or two teeth, our team will design a dental crown to bond to the dental implant. We make our dental crowns from high-quality porcelain that will look natural and feel great. Dentures: When you have lost most or all of your teeth, consider implant supported dentures. Several implants are placed in your jaw that will fix to the denture, creating a stable and functional denture that won’t slip or slide when you talk or eat. Implant dentures will last for years and are an effective replacement for traditional dentures. If you would like to find out more or ask any questions you have about dental implants, don’t wait to call us! We can also answer questions about any of our other treatments, including Waipahu and Mililani Invisalign. To schedule an appointment, fill our our online appointment request form. We hope we hear from you soon!